Industrial guard rail protects personnel and machinery while allowing for a safe and efficient work environment. Steel guard rail will reduce employee injuries, damage to machinery and equipment, as well as reduce costs associated with repairs. Each industrial guard rail is formed out of 11 gauge steel and welded to a 3/8×2” mounting plate. Rail is bolted to post with (4) 1/2×5 ½” bolts and nylon lock nuts. This hardware is included with every steel guard rail order. Rail lengths from 4’L to 10’L are in stock. Posts are pre-drilled for either corner or continuous layout design. Guard rail posts are 4”x 4” tubing welded to a 10” x 10” base plate 5/8” thick. Each base plate requires (4) 5/8×5” anchor bolts for mounting to floor. Single rail design requires 18”H posts, and double rail design requires 42”H posts. Posts pre-drilled for continuous or corner mount. 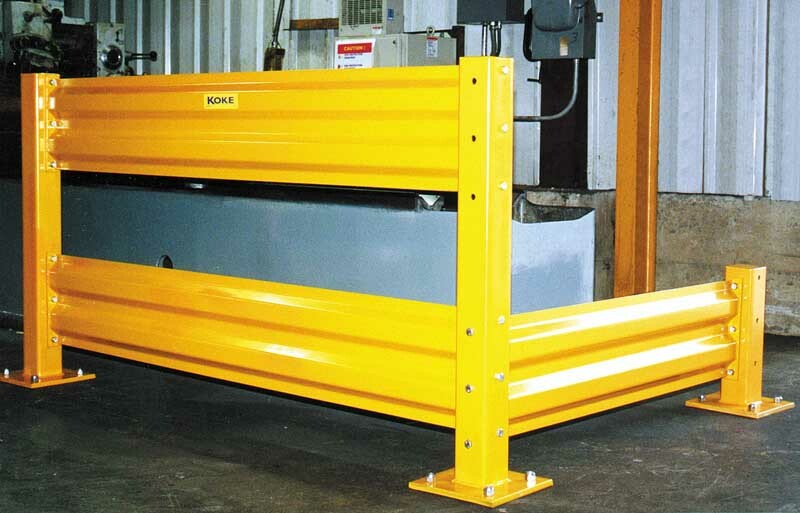 All industrial guard rails are painted safety yellow for high visibility. Slip-out brackets available for sections of rack that occasionally need to be removed for access. All systems are specifically designed to your requirements. Please call us with your details at (800) 535-5303.